Like they did two years ago, pilot's watches will once again take centre stage for IWC at the Salon International de la Haute Horlogerie Geneve watch fair next month. The Swiss luxury brand, which has made aviation-themed watches for eight decades, has good reason to do so. June 6, 2019, marks the 75th anniversary of the Battle of Normandy. The year will also see two pilots attempting to circumnavigate the globe in a Spitfire, one of WWII's most famous war planes. 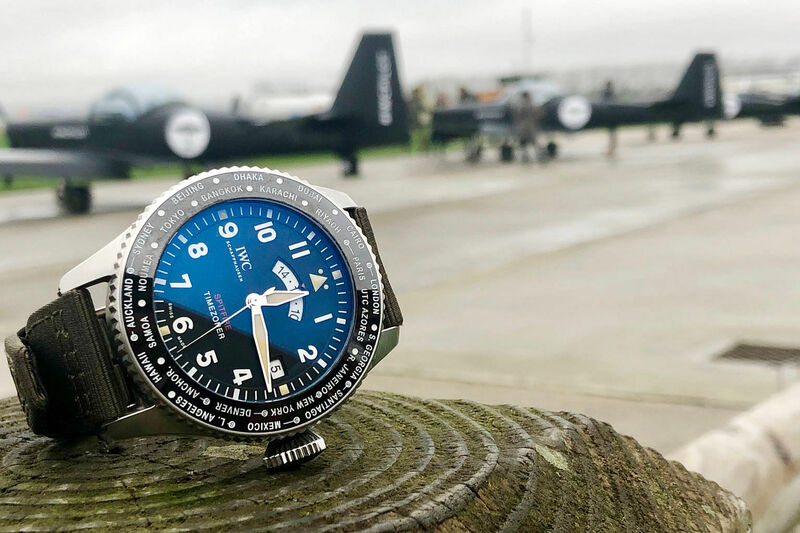 IWC - which already has timepieces inspired by this iconic aircraft - is the principal sponsor of this bold attempt named Silver Spitfire: The Longest Flight. The new collection comprises a new Spitfire line (all powered by IWC manufacture movements), a new Top Gun line, as well as Le Petit Prince special editions. Last week, four models from the new collection were unveiled at the Goodwood Aerodome in the United Kingdom. A special edition (250 pieces) dedicated to the Silver Spitfire: The Longest Flight project, this timepiece was specially developed for Mr Steve Brooks and Mr Matt Jones, who are piloting the aircraft around the world. It boasts the IWC Timezoner mechanism and the 82760 IWC-manufactured calibre, with Pellaton winding and a power reserve of 60 hours. The 46mm stainless steel case has a rotatable world time bezel and is water-resistant to 60m. The watch comes with a black dial and a green textile strap. The backbone of the new Spitfire line is fitted with a movement from the 6900 calibre family. With a watch case of 41mm, it is slightly smaller than previous models. 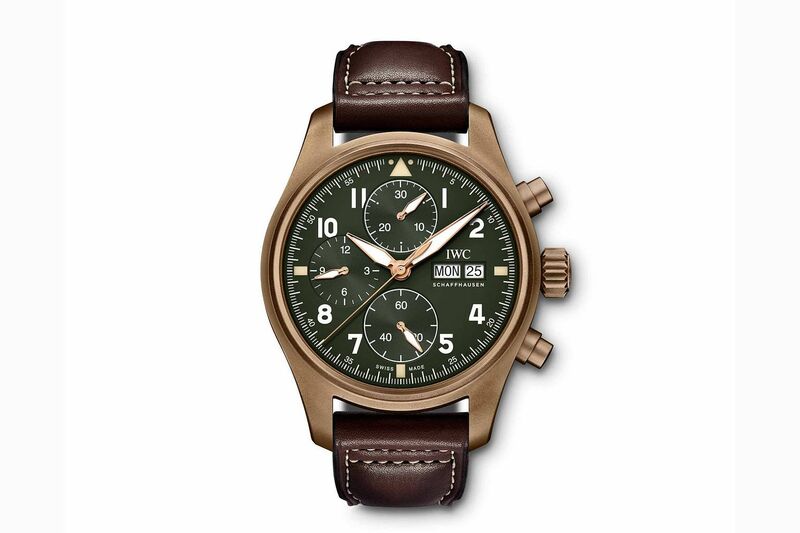 The case is bronze and the dial, olive green, making for an arresting combination. The bronze develops a special patina with age. This model has a power reserve of 46 hours. This is a stunning black beauty, fashioned for the first time from ceratanium, which was developed by the brand over seven years. The material combines the advantages of titanium and ceramic. It is as lightweight and robust as titanium and as scratch-free and hard as ceramic. The base material is a titanium alloy subjected to an extreme heating process to give it scratch resistance. The biggest advantage is that it can be machined and processed like steel, allowing IWC to create all watch components with it, resulting in the brand's first completely black design. The double chronograph is fitted with the 79230 calibre with self-winding mechanism and has a power reserve of 44 hours. It comes with a rubber strap and textile inlay. IWC has partnered the family of French aviator and author Antoine de Saint-Exupery - who wrote Le Petit Prince (The Little Prince) - since 2005. The collaboration has seen several special editions in the Pilot's Watches collection. 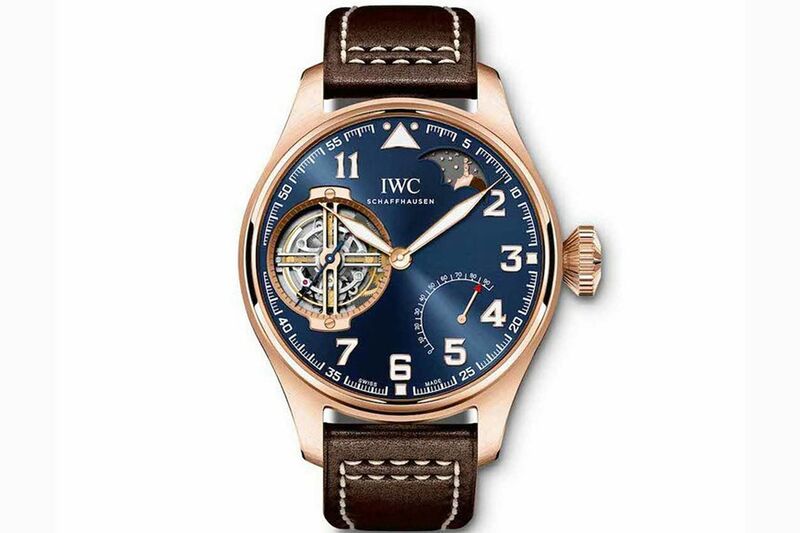 One of the new editions is this model made with hard red gold, a first for IWC. The new gold alloy is harder and five to 10 times more "wear-resistant" than conventional gold. Coming in at 46.2mm by 13.5mm, this big watch boasts a patented constant-force tourbillon, which reduces the forces of gravity on the balance spring. It is also fitted with the Calibre 94895, which features twin barrels providing 96 hours of power reserve. It has a gorgeous moon phase display sitting at one o'clock featuring The Little Prince himself.